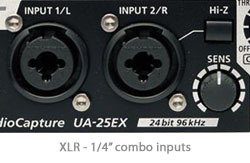 XLR cables are balanced inputs used primarily to connect your microphones to your mic preamps. You may also see these referred to as "Microphone Cable". On the output side, most studio gear will have an option to use these cables or unbalanced 1/4" instruments cables to send your signal to other gear such as studio monitors. This connector type uses a 3 pin configuration that is functionally identical to that of the balanced 1/4" TRS Instrument connector, though with a much different look. In short you have 2 pins transmitting your signal in such a way as to cancel out any noise introduced into the cable, and 1 pin to ground which acts as a voltage reference. Though that may sound complicated, it's actually an elegant, inexpensive, and simple way to eliminate unwanted signals from being transmitted. 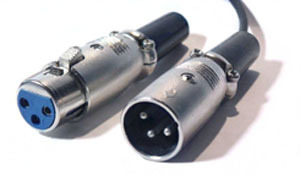 This connector is compatible with both standard XLR inputs as well as combo inputs, which are becoming more and more of a standard feature on newer audio interfaces. Just as the name suggests, the XLR - 1/4" combo will accept a XLR connector or a 1/4" balanced instrument plug. These combo inputs are great because it allows much more flexibility in how you use your mic preamps on your audio interface. These cables also deliver the phantom power (if you are using a condenser microphone) from the phantom power source on your mixing console or audio interface. The beauty is that you don't need a dedicated power line to hook up your mic, which is great because it doesn't take long to create a mess of cables that will rival the "annual untangling of the Christmas lights" routine. Don't get me wrong, the cable mess is almost unavoidable, but you can eliminate at least 1 power cord using the XLR's phantom power carrying capacity to your advantage. Like instrument cables, these will be used over and over so make sure you have plenty to avoid double booking them in different roles around your setup, such as the balanced output from your direct box. Between microphones, direct boxes, and studio monitors you'll definitely need more than a few of these XLR cables for your home studio setup. Remember that you don't need to spend a fortune on these as they can get expensive in a hurry. The fact that they are balanced will automatically reduce the amount of noise transmitted through them, and unless you're planning on taking them on a Trans-European tour even the cheaper ones won't fail you.